The first edition of the online Journal of the Brussels Process features the papers presented at the 9 July 2012 International Free Speech and Human Rights Conference held in Brussels. The Journal includes other papers also submitted to the conference from participants who were unable to attend. Alain Wagner introduces the conference on behalf of the International Civil Liberties Alliance (ICLA). He gave a brief outline of the purpose of ICLA and the contemporay threats that exist to democracy, human rights, and freedom of expression. He highlights sharia encforcement as a particular threat. Professor Jensen discusses the nature of sharia, how it impacts on non-Muslims, how it is undemocratic, and how it is academic rather than practical. He refers to the principle of abrogation. He goes on to discuss the concept of freedom of religion and what it means. Father Samuel discusses how has studied Islam and lived in the Islamic world for many years. He explains that as a resident in Beligium where he won legal action in favour of freedom of speech. He talks about sharia, the, plight of Christians in parts of the Islamic world, and asserts his support for Israel. Nidra Poller speeks as a novelist and provides a novelist’s way of looking at the situation. She discusses the collapse of freedom of speech and the reluctance of many to adequately confront this problem. She talks about the inadequacies of the media in properly informing the public, and about how issues are not considered in a holistic manner which means key factors are missed. She refers to the al-Durrah hoax to illustrate problems with media reporting and how Western rational thinking is being subverted. Alexander Del Valle explains the goals of the Organisation of Islamic Cooperation (OIC), in particular the aim to expand the reach of sharia. He refers to the OIC’s efforts in the UN with regard to “defamation of religions” and the latest incarnation of the OIC’s efforts – the Istanbul Process. Pierre Cassen discusses how France has departed from the principles of Voltaire and how many French citizens have been unfairly prosecuted for having opinions. He goes on to highlight some specific cases. Stephen Lennon outlines the presence of radical Islam in his home town of Luton. He explains how Islamic extremists abused soldiers who had come home from Afghanistan and how it was those who protested against this who were the ones on the receiving end of police action. He goes on to outline the ‘two tier’ system in the United Kindom in which non-Muslims appear to be treated more harshly by the state authorities. He talks about his own persecution at the hands of the British state. Lars Hedegaard accepts the 2012 ICLA Defender of Freedom Award that recognises his work to protect freedom of speech. More information about the Defender of Freedom Award can be found HERE. Ingrid Carlqvist talks about the situation in Sweden which she refers to as “Absurdistan”. She discuses the changes in the nature of Swedish society. She suggests that the changes have not been for the better. Ned May outlines how the atrocity in Norway in July 2011 has been used as a tool to demonise people across the world who are concerned about sharia. It has been used as a tool to outlaw sharia criticism and thereby has been employed to help the implementation of the agenda of the Organisation of Islamic Cooperation an agenda which is outlined in its 10 Year Plan. Magdi Allam explains how he has been a victim of sharia law. He refers to the fact that under sharia leaving the Islamic religion is a capital crime. He refers to use of fear as a tool used by Islamic terrorists but also says that a similar fear and a similar outcome is achieved via the speech codes that aim to prevent criticism of Islam. He suggests that there are certain values currently under threat due to moral relativism that are non negotiable values of Western Civilisation. Gavin Boby outlines the work of the Law and Freedom Foundation which helps local communities oppose planning applications for mosques. He explains the legal reasons which his organisation does this. Conny Axel Meier notes that 14% of Muslims in Germany would prefer to live under sharia instead of democracy. He compares the number of people in Germany who support sharia today with the number who supported Hitler in 1928 before he rose to power and thus highlights the danger that sharia could pose to German society. He highlights the cases of victims of repressive laws restricting free speech and the agitation of the Organisation of Islamic Cooperation (OIC) to criminalise criticism of Islam. Elisabeth Sabaditsch-Wolff the “soft” totalitarianism of the European Union that gets harder by the day and takes the form of a continent-wide attack on freedom of speech. She highlights the existence of EU laws that criminalise speech and effectively close down freedom of speech. Elisabeth outlines specific cases of prosecutions that have been carried out. free speech. He refered to his work for the City of Munich and how press and left wing activists mounted a witch hunt against him due to his views on Islam. He talks about his treatment at work and his subsequent legal action against the City of Munich. George Igler outlines the work of Discourse – Britain’s Institute for Free Speech which aims to engage in ‘reverse lawfare’ against prosecutions against those practicing free speech. Felix Strüning discusses the use of the label ‘Islamophobia’ as a tool to prevent criticsm of Islam and to stigmantise any critics. He highlights some of the weaknesses of the ‘Islamophobia’ thesis. Alain Wagner, introduces the Brussels Declaration and Brussels Process which were the main outcomes of the ICLA conference for Free Speech and Human Rights. The aim was to oppose sharia enforcement. He called on people to sign the Declaration and participate in the Brussels Process. The culmination of the conference was the reading and signing of the Brussels Declaration and the commencement of the Brussels Process that would help shape future work and provide a counterweight to the efforts of the Organisation of Islamic Cooperation to undermine freedom of speech and expand the influence of sharia. The second issue of the online Proceedings of the International Civil Liberties Alliance focuses on the Oriana Fallaci Conference and associated events that took place on the weekend of 15/16 September 2012 in the Italian City of Florence and on the OSCE Human Dimension Implementation meeting in Warsaw from 25 September to 5 October 2012. This Florence event, in honour of the memory of Oriana Fallaci and her important work in the cause of freedom, is organised annually by Armando Manocchia, President of the pro-freedom organisation Associazione Una Via Per Oriana. 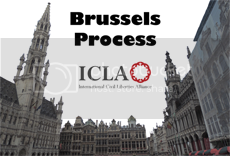 This year, as in 2008, ICLA was present but on this occasion we were able to promote the 2012 Brussels Process that was launched at a conference in the European Parliament in July 2012. The Oriana Fallaci conference has now become the latest component of the Brussels Process itself. An important aspect of ICLA’s mission to the OSCE this year will be the Brussels Process. Stephen Lennon receiving his award. OSCE Human Dimension Implementation Meeting Opens In Warsaw Today – The conference opened on 24 September. 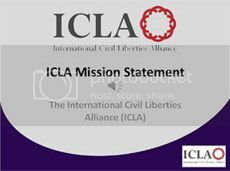 This article introduces the aims of the ICLA mission to the OSCE. State Interference With EDL Walthamstow Demonstration: A Violation of Freedom Of Assembly? – BPE Submission to OSCE Human Dimension Implementation Meeting – BPE Submission to OSCE Human Dimension Implementation meeting on 25 September 2012. The Victims of Sharia Observatory (VOS) is a new project that is part of the Brussels Process that was launched at a conference in the European Parliament in July 2012. VOS has been launched as a way of tracking the harm that sharia does to human rights all over the world. For some time now the Organisation of Islamic Cooperation (OIC) has lectured the world on human rights despite the severe human rights abuses that take place in many OIC member states. Invented terms such as “Islamophobia” have been put into circulation to blame the victims of sharia abuse rather than its perpetrators. We hope that this monthly report will help bring the truth to public attention. We will collect and collate news stories from around the world that illustrate the way sharia undermines the most basic principles of human rights. To help us in this task we would ask individuals and organisations to participate in VOS. We hope that other websites will get involved and republish the monthly reports and other VOS related materials. It is important for the whole world to realise the threat that sharia poses to human rights so that they can lobby for appropriate reforms. Indeed some sharia practices are so degrading that need to be considered by international law as crimes against humanity. Islamic tradition divides the world into two principal components, the House of Islam (Dar al Islam), and the House of War (Dar al Harb). The former is the Islamic world, and the latter is the land of the non-Muslims. This division is itself is provocative, divisive and encourages discrimination. The Dar al Harb is regarded as the House of War because it is expected that Islam will agitate in those areas in order to convert it to the House of Islam. Mechanisms that encourage sharia in that area are ones that are intended to facilitate that transformation. For this reason we separate our observatory based on these two components. The observatory will have separate sections for each component. Initiatives in Western countries that we believe will facilitate the spread of sharia into those areas will be highlighted in the Dar al Harb section. Sharia based human rights violation in the Islamic world will be highlighted in the Dar al Islam section. More information about the VOS observatory including the monthly reports can be found HERE. ICLA launched this initiative as a way of tracking the harm that sharia does to human rights all over the world. This Project builds directly onto the Brussels Process.